When you work with me you don’t have to gamble. You not only get a powerful copywriter, you get an experienced marketer who has worked directly with clients developing strategy, negotiating contracts, and creating campaigns and delivering breakthrough results for over 25 years. My clients will tell you my unique approach to business problems have delivered results far in excess of their expectations. Whether I deliver client development, executive negotiations, business strategy, copy concepting and development, or entire marketing campaigns they rave about the value of what they received in exchange for their investment. Another big benefit is you won’t need to spend your valuable time explaining marketing to me. Over the course of my career I have created campaigns, negotiated contracts, designed strategies, and developed clients from just about every industry category that exists and in just about every form of communications. When you work with me you will not only be working with a seasoned veteran who knows how to market but someone who is proud to say she follows through on her commitments. You will have your project returned – on time, on budget, and on target. You have my promise. Karen has the sales and client development skills to either lead a small business to become big or to start selling battleships to the Navy for $1 billion each! "Working with you for over five years was an amazing experience; you are one of the smartest marketing executives I have ever worked with. You are creative and full of energy. You could easily sell ice to an Eskimo! Your quick thinking successfully launched our products to market, under budget and ahead of schedule. I especially appreciated your effective leadership; you can lead any team to sales excellence!" 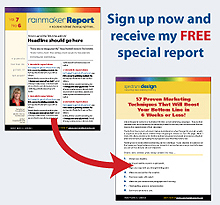 Request your copy of my complimentary report. “57 Proven Marketing Techniques That Will Boost Your Bottom line in 6 Weeks or Less ” Don’t spend another marketing dollar until you’ve read this report. Schedule a project now or refer a new client to me that schedules one and receive a limited time, special discount on your next copywriting project – A valuable offer and an easy way to test my services without breaking the bank. Ready to discuss a project? Contact me today!